Throughout my raw journey, I find myself constantly redefining who I am and how I want to live. I see every experience as being perfect for my physical and spiritual growth. I am moving into a new space in consciousness where I am willing to see myself differently, and create new thoughts about myself and my life. A major part of this transformation took place over the last few days, when I attended an amazing, awe inspiring and deeply soul searching event: Karen Knowler's Raw Transformation Experience - where I spent 3 awesome days with Karen, met many amazing people, and made deep connections with some beautiful souls. Karen has the amazing ability to be down-to earth, inviting and approachable, whilst being a total inspiration, a true mentor and a raw goddess! The food throughout the three days, lovingly prepared by the wonderful Russelll James, was absolutely amazing. We were blessed with an abundance of living foods from green smoothies to Raw Burgers - it was such a treat not to have to prepare my own food! Karen and Russell also demonstrated a range of tantalising recipes from the quick and easy to more complex dinner party delights (including the Chocolate Vanilla Torte pictured)- which couldn't fail to inspire! The Raw Transformation Experience took us on a life-changing journey from the time we feel that 'Inner Call' to the ultimate dream of 'Living Magically on Raw'. This journey is one of passion and clarity in which we created our own unique vision of our superhero self, and with Karen's expert guidance and support, we devised a rock-solid game plan that would support us internally and externally and keep us on track as we move towards our ultimate goal. The event moved me in ways I hadn't pre-empted, and rocked my inner core. During a guided meditation, I had an amazing, goosebump inducing experience: I felt that I met and embodied my 'superhero self' - the me of my dreams. This has given me great strength. I now know that I need to look within to find my superhero, and can draw on her strength and courage at times of challenge, secure in the knowledge that she and me are now one; I'm no longer chasing her, but am able to live my dream - if I so choose. A major emotional meltdown for me was the challenge to name and meet my nemesis. I recognise that the one thing that is constantly holding me back from really being free is that feeling of self-doubt which has been perpetuated throughout my life by negativity from those around me. Having opened myself up to this knowledge, I have made a commitment to myself to conquer my nemesis and set myself free. I have created my vision and know what steps I have to take to make that true for me on all levels, body, mind, heart and spirit. I now feel empowered to break through the barrier that has been holding me back and refuse to be pulled back into the spiral of self-doubt and self-sabotage. As I make choices in life around food, work, home, life...I commit to living consciously, to check in with myself to make sure that the choice is in alignment with my vision. I feel I have gained deep clarity, focus and direction, and am ready to give myself permission to BE. There is so much I could share about my experiences during this event... maybe I will one day. To celebrate the end of our journey, we were treated to a raw dinner party and disco! We diner on the best food in the planet and danced into the night! The first of many such events I hope...! I'm really excited to announce the date for my next class. Friday 4th September 2009! Check out 'Raw Liberty Classes' for details of what has proved to be a fun, inspirational and delicious day! 'Thank you for the professional, well organised, knowledgeable and inspiring session I spent with you last week. Your coaching has helped me to get back and keep on track, as like you I live with a cooked family and we both know how difficult it is in the beginning. You have made me realise that I have been trying to be too much of a perfectionist and this has been holding me back. I think this comes about through reading so much literature, although this is inspiring it is nothing compared to having a personal coach. Thank you again; I would not hesitate to recommend your coaching sessions.' Linda Burns, Manchester. Although everyday is a green smoothie day for me, this Saturday, August 15th is International Green Smoothie Day! Join me and the Raw Divas in celebrating simplicity, affordability, empowerment and health! They always say time changes things, but you actually have to change them for yourself….. So, the exciting news is that Raw Liberty is taking the first steps in a major upgrade! Firstly, I’m very excited to be holding my first (of many) one to one classes tomorrow, in which one very special lady will have my undivided attention for a whole five hours, to sample at least twelve different delicious raw food recipes which will take her from breakfast, through to lunch and culminating in a three course dinner! The second update, and the one I’m most excited about, is that on Sunday, I’m heading off to Cambridge to attend the amazing Karen Knowler’s Raw Online Business Training Programme! I’ll be working with Karen and two other wonderful ladies, to produce an amazing online business in which I can turn my raw passion into my vocation! 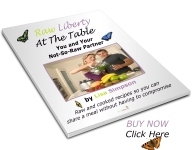 This programme promises to be life-changing, and should give me all the tools I need to create a very special place for you to discover more about raw food and how it can transform your life beyond your wildest dreams, and where I can help you become the person you’ve always dreamed of being! I’m so excited about the changes that 2009 is going to bring. I’ve just started a programme with the gorgeous Claire aka The Raw Bombshell. The essence of this programme is to release the real me, my inner person, my ‘bombshell’. This is the person I allude to be, but don’t yet claim. I’ve asked myself, ‘How is not being true to myself and my needs of any benefit?’. Well it’s clearly not, so why is it something that seems so easy to do. It’s a familiar pattern and even though it may not be for my better good it sticks around preventing me from moving on to release my inner bombshell. Once I learn to lay negativity to one side I know I’ll find it easier to allow the ‘good stuff’ into my life. So I commit to letting negativity bounce off me rather than being absorbed to my core, and welcome the new changes this brings to my life. What we eat affects the person we are and the way we deal with our lives. It’s all too easy at times of stress or emotional upset to reach our for the so called comforting foods and drinks, but in reality this doesn’t help things in the long term and those same stresses are still lurking there waiting to knock us back again, but this time compounded with the guilt we feel for having given in to consuming the food and drink we knew wouldn’t serve our bodies. What we eat is a gateway to us finding our greater selves – to balancing our body, mind, emotion and spirit. When our body isn’t fighting the toxins we put in it, it becomes free to let us become our true selves. It is important to find our inner self and stay true to it. Through the support of this programme and Jo Thomas’s Destination Fabulous, I intend to release my inner bombshell, to look and feel radiant, and feel truly alive. I open new doors and express gratitude for what is. The future is out there waiting for me …..
What is your dream outcome for The LBD Programme? To feel fantastic on the inside and look fantastic on the outside. To love myself and ooze confidence about my lifestyle choices. Where are you at now compared to you dream outcome? I think I’m more focussed as from today. I’ve reaffirmed my commitment to my dream outcome. I’ve committed to increasing my greens and have had a green juice every day for breakfast, a green smoothie every day for lunch and greens with tea, which has been largely raw. What changes do you think you need to make to your diet or lifestyle to get you to your dream outcome? I need to tackle my emotional eating/drinking head on, and have made a commitment to do that – since our call. To distract myself when I feel the need to numb myself. I want to draw on all the areas of support I’ve learned this year, journaling, breathing, chanting, gratitude, crystal healing, meditating, affirmations, personal law. I have all these tools, now I need to use them in my journey – working on mind, body and spirit. Name one thing you achieved last week that has got your closer to your dream outcome……Winning the ‘Green Smoothie’ competition and having 30 mins coaching from Jo! I wasn’t sure what I’d get from a coaching session, but how wrong I was. I’m seriously considering signing up for another session next week. Is there anything you need from me that would help you on your LBD journey? Such as me setting you short term goals, or us having daily check in emails…..whatever it is you need don’t be afraid to ask for help…The daily check in emails would be great thanks. I’m not sure if I need a loving approach or a firm one! Let’s go with loving for this week, as love is missing from my life at the moment.